DivX / XviD backup utility. With support of DVDs, MPEG2, MPEG1 sources along with AVI/DV sources. 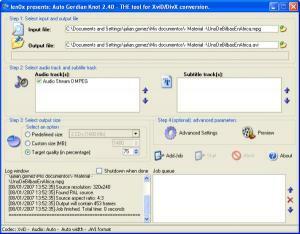 AutoGK is designed mainly for people who know very little (or nothing) about video conversion and want to create videos in a few clicks of a mouse. Forget the times where you had to learn about resolutions and bitrates, worry about finding a suitable splitting point, perform compressibility tests and adjust resolutions accordingly, bother with interlaced and progressive content, etc. AutoGK does all that for you.